Cheeseboards are a wonderful thing – the perfect treat at the end of a long day, a fantastic light lunch or indulgent snack, and a delicious way to round off a meal. There are many ways to serve your cheeseboard, and it can be as humble or as grandiose as you like! Here are our suggestions for the perfect cheeseboard, guaranteed to hit the spot. Always store your cheese wrapped, in an airtight container in the fridge, away from other strong smelling foods. This will ensure that your cheese keeps its true flavour and prevent it from drying out. Remove your cheese from the fridge an hour before serving, so that you can enjoy the full flavour and texture of the cheese. 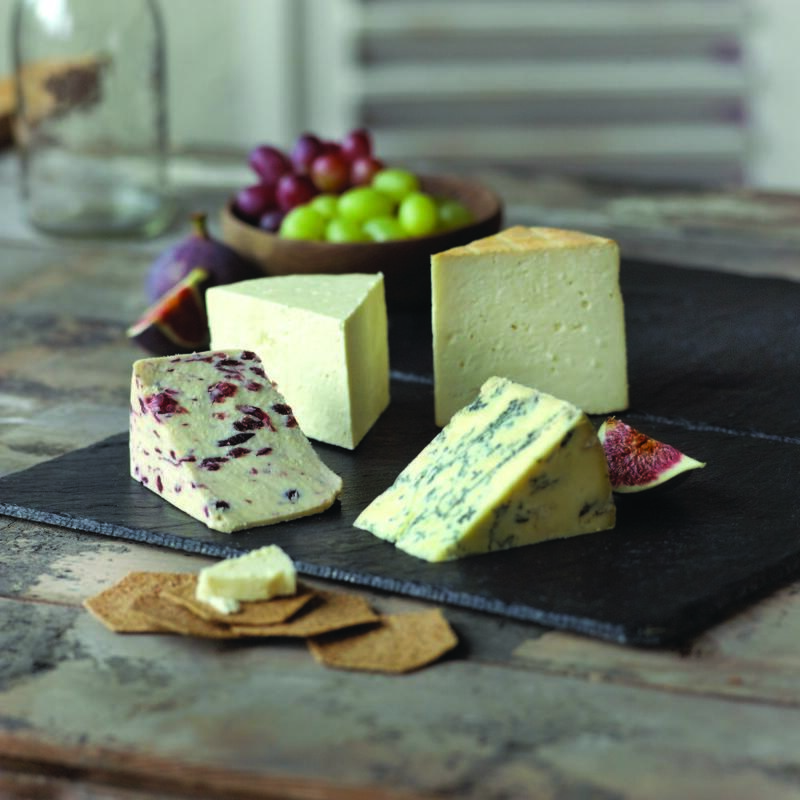 Allow approximately 80g of cheese per person for your cheeseboard; we recommend 4-5 varieties. Think about a selection of cheese varieties that will give you a contrast of flavours, textures and colour on your cheeseboard. From mild to mature, sweet & nutty to fresh, citrus flavours, to creamy to crumbly, or hard textures, to fruity or savoury, or smoked to blue, there is so much choice, and something for everyone to enjoy. Choose a selection of crackers to serve – different types of cheese will match better to different varieties of crackers, and this will also add visual appeal. Serve your cheese with a selection of accompaniments – choose from grapes, chutney, quince, freshly cut apple or pear, celery, nuts, figs, dried fruit, or cured meats such as Parma ham and prosciutto. Choosing your chutney is also worth considering, as different types of chutney work well with different cheeses. For example, a naturally sweet chutney made from apple, sultanas and traditional spices, pairs well with Yorkshire Wensleydale cheese. Rosebud Preserves make a particularly good one! Whereas a richer, full bodied chutney such as Fig or Red Onion Marmalade is superb with Wensleydale Blue and Kit Calvert Old-fashioned style Wensleydale. You may also wish to include some fresh crusty bread, and some good quality butter. Salted butter is best as the flavour complements the cheese. Above all – our most important recommendation is to take time to enjoy your cheese! The best thing with Wensleydale cheese is a moist piece of fruit cake.